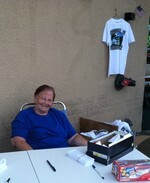 Anne Keegan is pictured selling raffle tickets and T-shirts for the Cornwall July 4th Independence Day Committee in front of DeCicco Family Market in Cornwall Plaza. Anne has been a volunteer with the Committee for approximately 10 years. To make a donation, please go to http://cornwall4th.org for contact information.